This is the long-overdue third part of the Hancock analysis. My apologies for the delay. You can read part one here and part two here if, like me, you totally forgot what the heck was going on in this series. The original intent of the screenplay that Hancock is based on is that Hancock is Superman. Although the Jason Bateman character was originally named Horus, somewhere along the line he became Ray (Re, Ra). His character's son was a major character in the original screenplay but was not in the film, since the thrust of the script (no pun intended) became about Ray and Hancock's relationship. When Ra reigned as king over Egypt he sailed up the Nile towards Nubia, because his enemies were plotting against him. At Edfu Horus entered the bark of the great god and hailed him as father. Ra greeted the hawk god and entreated him to slay the rebels of Nubia. Then Horus flew up to the sun as a great winged disk, and he was afterwards called "the great god, the lord of the sky". He perceived the enemies of Ra, and went against them as a winged disk. Their eyes were blinded by his brightness, and their ears were made deaf, and in the confusion they slew one another. Not a single conspirator remained alive. Ra afterwards visited the battlefield, and, when he saw the dead bodies of his foes, he said: "Life is pleasant." This story has an interesting parallel in Hancock when the police summon Hancock from prison to take down a heavily armed gang of bank robbers. Ultimately this episode was orchestrated by Ray, who has a similar epiphany to Ra's when his plan to rehabilitate Hancock succeeds. So this unlikely relationship between Hancock and Ray has its roots in the ancient literature, as does the tension between Hancock and Mary (read Isis-Meri), since Horus reportedly beheaded Isis when she took pity on Set. 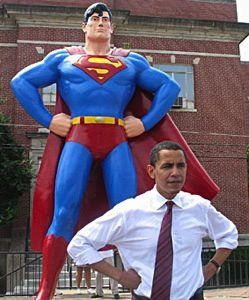 Given the relationship to Superman (whose own god is Rao) it's should be noted that we also have a tantalizing Synchromystic link with President-elect Obama, a bonafide geek who has not been shy in identifying with Superman. I didn't catch any obvious alien subtext in Hancock, but he and Mary's longevity is certainly reminiscent of the immense lifespans of the Anunaki in the ancient literature. So, yet another blizzard of weird correspondences to mull over. And a whole host of questions as to what we are actually looking at. Are these just easter eggs or still more evidence of the power of archetypes to tell their own story once set in motion? It could be a little of both. There's little trace of any of this in the original Tonight, He Comes screenplay, and it's certainly not Vince Gilligan's style either. However, one thing I've learned is that screenwriting credits don't always mean much, and that there are often other hands on deck, often getting producer credit - or often, no credit at all. 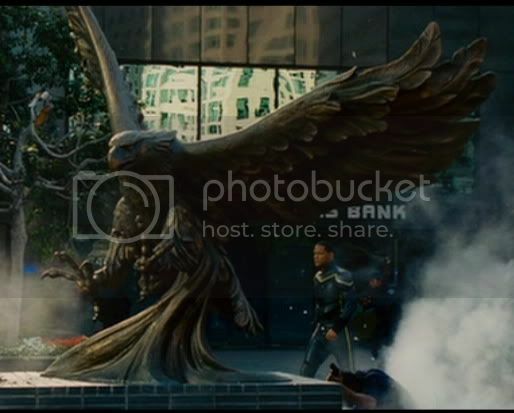 One of the producers on Hancock is Akiva Goldsman, who is no stranger to hidden messages and secret symbols, having written the screenplays for The Da Vinci Code and the upcoming Angels and Demons. In the Hancock DVD doc, Goldsman gets a lot more screen-time than Gilligan, and seems a lot more involved with the shaping of the narrative. 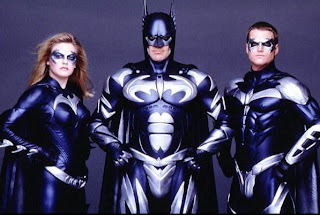 Goldsman is no stranger to superheroes either, having served as the credited screenwriter for the Schumacher-era Batman films, Batman Forever and Batman and Robin (the latter starred George Clooney, himself no stranger to sun god symbolism). Who better to write this very interesting film? Ancient space gods and all the rest of it makes me think of Scientology as well. And of course Will Smith is now BFF with Tom Cruise, High Priest of the Church of L-Ron. After wrapping Hancock, Smith even gave the crew gift cards for CoS "personality tests." 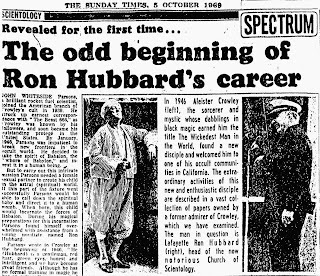 Pondering Cruise and the various scandals over some of the more prominent Scientologists reminds me of L Ron Hubbard and Jack Parsons, going off into the desert together in January of 1946 to do a little boundary crossing of their own, the so-called "Babalon Working." Both were members of the OTO at the time (though Hubbard later claimed he was actually spying on the group), though we have no clear record of what degrees Hubbard may have attained. Regular Secret Sun readers know that this occurred at the exact same time that the US Army was sending radar signals to the Moon from Fort Monmouth, New Jersey with Project Diana, the first known project to make contact with another celestial body (given Parsons and Hubbard's contacts with the MIC, it's possible they coordinated the Working with the radar test). 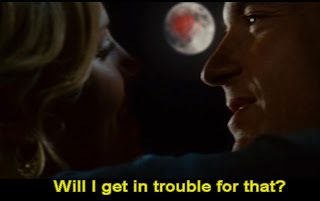 Interesting then to note that Hancock ends with the image of a giant red heart painted on the moon for Ray by Hancock. Incidentally, both Parsons and L-Ron were closely associated with Aleister Crowley at the time of the Babalon Working, though I'm not sure how they themselves defined the Eye of Horus, or if that figured somehow into their summoning of the "Scarlet Woman." How strange that these obscure rituals still reverberate to this day.